I can’t write without a reader. It’s precisely like a kiss—you can’t do it alone. Welcome to the Write Right Podcast. 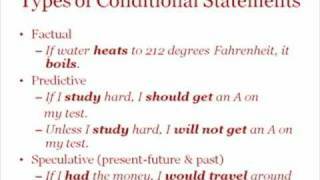 Today, we’re going to be talking about conditional statements—what they are and how to use them. First of all, conditional statements follow a basic construction of an if clause plus an independent clause. The if clause can be introduced by if, unless, or when. There are four basic types of conditional statements: factual, predictive, present-future speculative, and past speculative. First we’ll talk about factual conditional statements. Factual expresses factual relationships, such as scientific truths or habitual truths. Scientific truths always use the present tense. For example, in the example “If water heats to 212 degrees Fahrenheit, it boils,” the verbs “heats” and “boils” are both in the present tense because every time that water heats to 212 degrees, it boils. Now with habitual truths, you need to use the same tense for both verbs in the sentence. So in the example, “When I study hard, I make good grades,” since I used the present tense “study” in the first part, “make” also needs to be in the same tense as “study.” So they’re both in present tense. And that concludes our lesson on conditional statements. Thanks for listening.